"These 1100L 4 wheeled bins with lockable lids are an excellent resolution for outside waste storage needs. At maximum capacity they hold a staggering 1100L of waste, making them perfect for industry requirements. The 4 corner castors allow them to be moved effortlessly, their measurements are H 1450 x W 1400 x D 1200 mm. The lockable lid allows for secure waste disposal and ensures that no-one unauthorised is able to dump their debris in the bin without consent. Another advantage of this is that it will keep unwanted pests from rummaging through the refuse and prevents the bin from opening undesirably in stormy weather, keeping it neat and shielded from the elements. 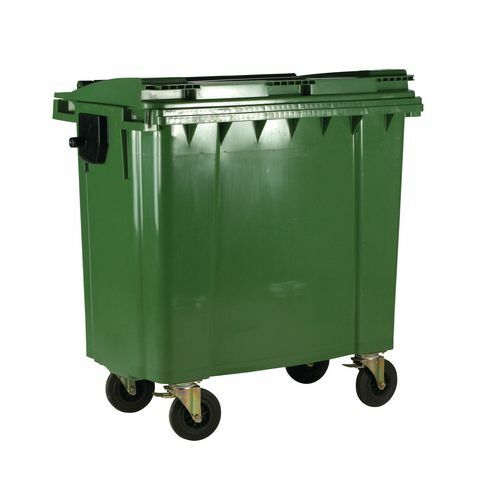 Whatever your waste storage requirements are, these bins are a practical choice to suit any waste disposal needs. The bins come with a 12 month guarantee; they are available in blue, green, grey and yellow."